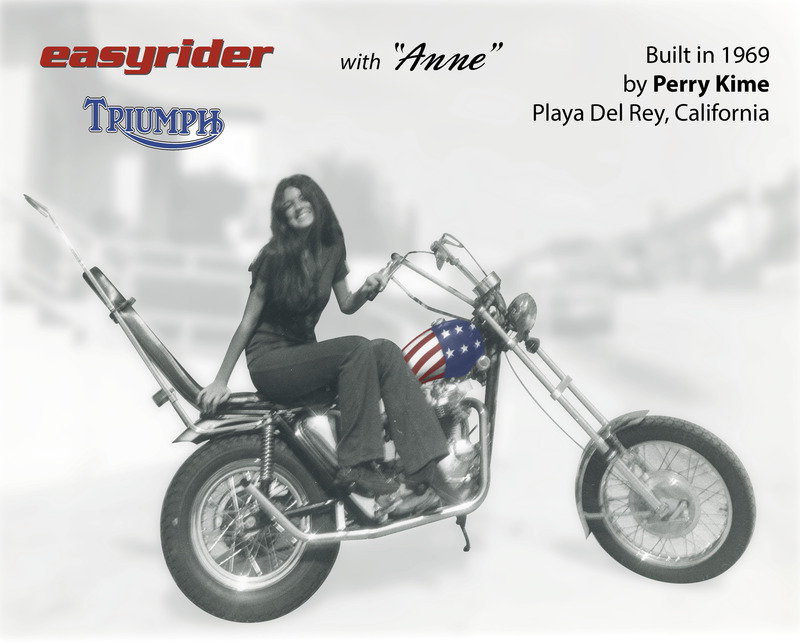 In 1968 I moved to Playa Del Rey, next to LAX, set up a small shop in a two-car garage and went back to building motorcycles. Custom bikes had always appealed to me and around this time they were becoming extremely popular. I built some choppers and cruisers, mostly Shovelheads, before going to work for Harry D. Foster, another legend, but this time in the motorcycle racing world. Harry was a well-known engine builder for Triumph’s successful flat-track racing program. Working on these temperamental two-valves to get maximum power and torque without breaking anything, I learned many secrets that I later put to use building Harley-Davidsons. I was now getting requests from all over the country to build motorcycle engines for custom and race bikes, mostly Harleys, so in 1978 I moved out of the noise and pollution of Los Angeles, a couple hundred miles up the coast to the quiet town of Oceano. Immediately upon moving to Playa Del Rey, Perry became involved in a number of cultural activities. 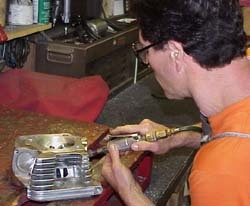 Perry has built the engines for custom Harleys for celebrity clients in L.A. and across America. I opened up a small shop, called it FLO Dynamics, and planned to specialize in aluminum-based headwork for Harley-Davidsons. Like titanium, aluminum is hard to work with but if you know the techniques can give you major power and lightness benefits. My years of race engine building under the masters were paying off. Orders started coming in right away, and I came to the attention of Keith Ball, editor of “Easyriders” magazine. He encouraged me to take photos and write tech tips for his mag. At my shop I developed and patented a new technique for porting that maximizes airflow and thermal efficiency. My Tooled Finish technique is included with my Super Port Flow head porting service on Harley heads from all generations, and uniquely tuned for each one. Perry porting an Evo cylinder head. 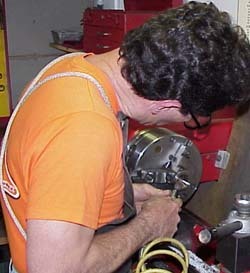 Every one of Perry's valves is made by hand. I wasn’t satisfied with either the factory valves or the aftermarket alternatives, so I created my own. Starting from that time and continuing to today, each one of my performance kit valves, valve springs and valve seats are matched by hand, by me. Dissatisfied with the stock carbs at that time (and continuing today!) I developed a computer program with enables me to blueprint CV carbs on the bench. My CV carb modification, combined with my optional high-flow air filter kit, vastly outperforms the stock unit. This was a very productive period for me, and a happy one. 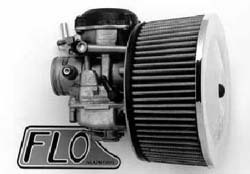 Keihin CV carb with Hi-Flow air filter.